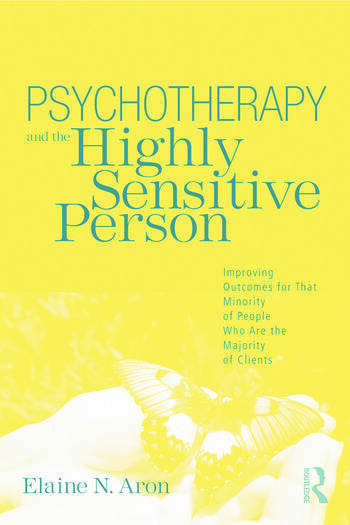 Dr. Elaine Aron’s newest book, Psychotherapy and the Highly Sensitive Person, redefines the term “highly sensitive” for the professional researcher and practitioner. She dispels common misconceptions about the relationship between sensitivity and other personality traits, such as introversion and shyness, and further defines the trait for the benefit of both the clinician and patient. Readers will learn to assess for the trait, distinguish it from clinical diagnoses such as panic disorder or avoidant personality disorder, understand how sensitivity may change the presentation of a problem such as depression or shyness, and generally inform, validate, and improve the quality of life for these clients. She pays particular attention to self-esteem issues and helping patients separate effects of their innate temperament from problems due to their personal learning histories. Dr. Aron keeps both patient and practitioner in mind as she suggests ways to adapt treatment for highly sensitive persons and how to deal with the typical issues that arise. Three appendices provide the HSP Scale, a summary of the extensive research on this innate trait, and its relation to DSM diagnoses. Through this helpful guide, therapists will see a marked improvement in their ability to assist highly sensitive clients. Evidence for the Basic Innate Trait Being Sensitivity, and How it Relates to Vulnerability, Shyness, Introversion, and Proneness to Negative Affect. Assessing High Sensitivity. Distinguishing Sensitivity from Disorder. Recognizing and Addressing Five Almost Inevitable Problems. Adapting the Psychotherapy Process. High Sensitivity and Diversity — Ethnicity and Gender Issues. The Highly Sensitive in Close Relationships. Finding Meaningful Work and a Comfortable Work Place. Specific Treatment Approaches and Specific Clinical Problems. The Role of the Temperament of the Psychotherapist. Elaine Aron, PhD, has published numerous articles in academic journals on the highly sensitive person, including surveys, laboratory experiments, and neuroimaging studies. Her writings on other topics include books, chapters, and journal articles on close relationships as well as co-authoring a statistics textbook. Her writing for the general public includes the best selling Highly Sensitive Person, The Highly Sensitive Child, and The Undervalued Self. Dr. Aron maintains a psychotherapy practice in the San Francisco Bay Area, teaches public and professional workshops, and continues her research on the trait of sensitivity.